Quite true. I would love to have Atlanta’s (or Dallas, or Las Vegas, or San Fran…etc) average winter temps compared to the NYC/NJ/CT area! 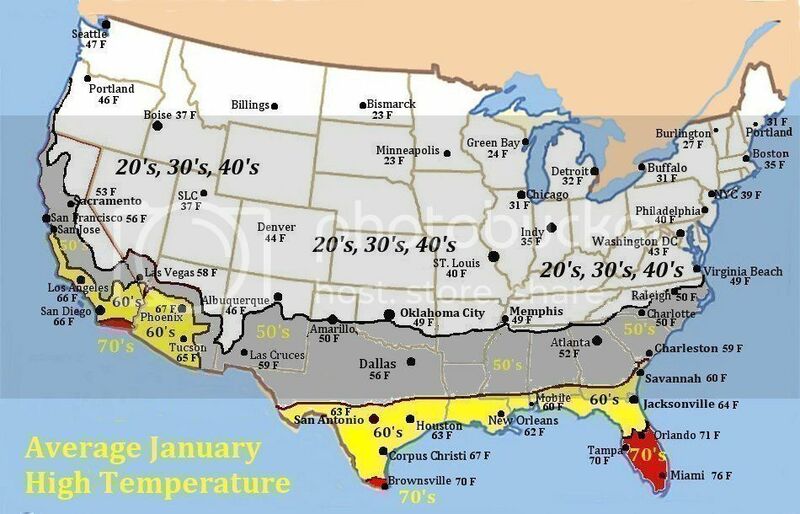 I was always sruck about how inverse the north/south gradient of summer vs winter temps are in the USA. By this I mean, that in the warm/hot season, the gradient of increase in average mean temps from north to south is very gradual…and very small. In the cold season, the gradient of increase is three times (or more) more rapid. For example the average high in June or August in Bismarck might be 84 F….and even if you go 1400 miles south to say New Orleans or Corpus Christi down on the Gulf Coast - the average July high is 92 F – only 7 or 8 F warmer. Travel south in the winter, and the same gradient (about 8 F or so) can be reached 1/3 the distance (say 600 miles or so): The average January high in Bismarck is 23 F….but its 40 F (17 F warmer) in St. Louis. Go another 600 miles to Amarillo, TX and its 27 F warmer…..and go down on the Gulf Coast to Houston or along the lower East Coast to Jacksonville and it’s F 40 warmer! The rapid increase/decrease in average temps is much greater in the cold season than the hot season. We forget in the northern USA that even highs 4 or 5 F below normal in the far southern USA is rather warm by northern standards. Of all the traveling I’ve done (USA, Europe, Asia, Caribbean…etc.) to this day one of the most inspiring travel experiences is heading down the East Coast from north to south in the heart of winter: You go from leafless trees, temps in the upper 30’s F, dormant farms, and maybe even a dusting of snow on the ground….to a semi-green landscape in southern North Carolina, with some evidence of farm activity….to a fully green landscape, with alligators lurking in swamps, even flowers in southern Georgia….to hot 77 F temps, coconut palms swaying in the breeze, lizards running everywhere, farms buzzing with sprinklers going and workers in the field, and people laying by the pool/on the beach from central Florida southward. Traveling through the gradient of season and temperature still amazes me to this day.